Can’t get the kiddos to eat a regular bowl of oatmeal? Or just want to switch up your own breakfast routine? 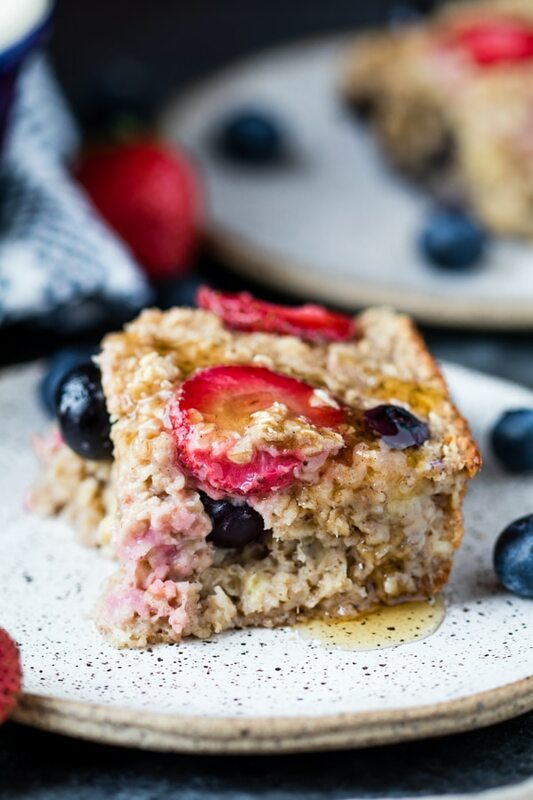 This oatmeal berry bake will do the trick! I can count the number of times on one hand I ate oatmeal growing up. I just didn’t enjoy it – it was always cereal, toast, eggs, pancakes…something like that. I never actually thought oatmeal tasted good until my middle school/high school years when I was serious in athletics and needed something more than sugary cereal (Frosted Flakes and Cookie Crisp mmm). Let’s be real though, oats plain just aren’t fun. However, using your oats to make a bake is fun! Especially if you have picky eaters at home, or are just over regular oats and want to switch things up for your morning routine. You’ll love this one! Enjoy! What are the best oats to use for oatmeal bakes? I personally like the quick 1-minute oats best. The bake holds shape really well! Can you freeze this for meal prep throughout the week? You bet! Make sure it cools before placing in freezer! I like to cut it up into portions and then heat it up in the microwave the morning I want it! What other oatmeal recipes are your favorites? This cozy snickerdoodle cookie oatmeal bowl is a perfect Fall or Winter breakfast. Or if you’re a fan of overnight oats you’ll be sure to love these pumpkin pie overnight oats! If you need some protein to go along with your oats I recommend this high protein quinoa scramble – fresh and satisfying! Easy, tasty, nutritious and more fun than just a bowl of oats! Preheat oven to 350 degrees F. Spray a 9x9 oven safe baking dish with PAM. In a medium bowl, whisk together dry ingredients & set aside. In another medium bowl, whisk together all wet ingredients and then gently stir in 1 cup of the fresh berries. Gently mix the wet ingredients into the dry, and then pour into baking dish. Place remaining berries on top of the bake. Bake for 45 minutes, or until completely set. If bake is too dry for your liking, add a splash of milk when serving. 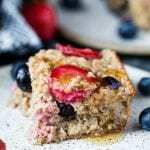 PIN THIS SIMPLE BERRY OATMEAL BAKE RECIPE FOR LATER!